August 2, 2017 / J.K.
Part Thaler autobiography, part time line of the development of the field, with plenty of humorous anecdotes and academic ‘anomalies’, this book does not read like a history of an academic discipline. The book is broken into eight broad chapter based around years in which Thaler worked through differing parts of the development of the field. The chronology starts with him as a graduate student, where he is just starting to look into ideas that would become the discipline, and proceeds up to the present, where he seems poised to hand over the reins to the next generation. Along the way are his stories of getting the discipline recognized by academic journals, struggles with the establishment, and gaining allies (across other disciplines, as well) and students that will become the next generation. This book, like the somewhat related book (Thinking, Fast & Slow) by his fellow collaborator, Daniel Kahneman, kind of annoyed me in how well it is written. Thaler has had a nearly five decade career as researcher and writer, so he should write well, but that is not what I mean. His book is funny and reads quickly like a narrative. As I said above, it it part autobiography, and lends itself tremendously to humorous narrative that leaves you interested in reading more. As a pretend internet researcher and writer, I am envious that someone with actual credentials writes so well. All that being said, I think I missed the subtitle of this book when I first heard about it a few years ago. I heard Thaler on a interview, and knew he was related to behavioral economics, but didn’t quite realize this was book he was promoting. I must have searched his name on amazon and bought the first book I saw, without noticing the reference to ‘Nudge’ on the cover. Nudge was really the book I was looking for, which is more about the research out of Behavioral Economics as it relates to topics like money and health. ‘The Making of Behavioral Economics’ should have clued me in to this book being more of a history. Luckily, I enjoy history and biographies, and as I said above, he is a very talented writer. One of the first things that stuck out to me was how long he as been in the field. His book starts in 1970, with him as a grad student. I wouldn’t be born for another decade and a half, and I don’t consider myself very young. I’ve heard that Millennials will have between seven and 17 careers over their lifetimes, so it amazes me to read of someone’s history in a field that is longer than my lifetime. Reading history is always fascinating, because you, with the addition of hindsight, can read and say, ‘how did these people miss this?’ I couldn’t believe some of the resistance he and others would face as the argued against the efficient market hypothesis. I was in high school during pets.com (look it up kids) and the tech bubble and finished grad school a few months before the housing bubble popped, so I struggle to believe in any way the the market is efficient and that people are well informed. Thinking back to my undergrad economics courses, I believe I was taught the distinction between theory of economics (people who Thaler calls Econs) and actual behavior (called Humans). In grad school, the distinction was called that of theory and practice. So, it is interesting to see that a few decades before, saying things like this, which to me are clearly true, would get you laughed out of conferences and barred from academic journals. This history was interesting, and the debates with other academics were amusing and insightful, but the book really shines with the anecdotes. I won’t go through all of them here, but the include an economist who refuses to sell his wine (for a gain) at the market price while also stating he would never buy it at the price and companies whose stock prices are lower than their subsidiaries (even when purchasing the larger company stock means getting the smaller companies stock included; this means the larger company is valued in negative dollars relative to market cap). These types of stories are what I enjoy reading. They are amusing on their own, but also challenge your assumptions about certain areas, but even more, make you really question whether you actually know what you are doing. You may think you do everything rationally, but you probably don’t, and that is illustrated time and again in this book. If you are looking for just stories and research results, you are probably better off with Nudge or Thinking, Fast and Slow . 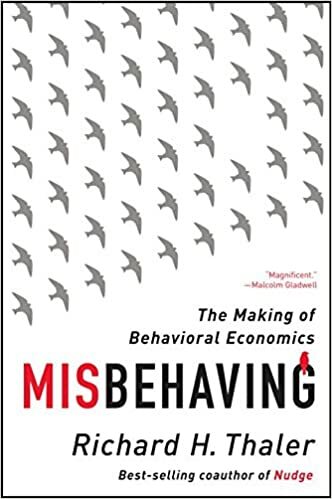 However, if you are interesting in Behavioral Economics in general, this is definitely a book to put on your list.